Special edition includes blue hull and tanbark colored sails. Hull is blister free. 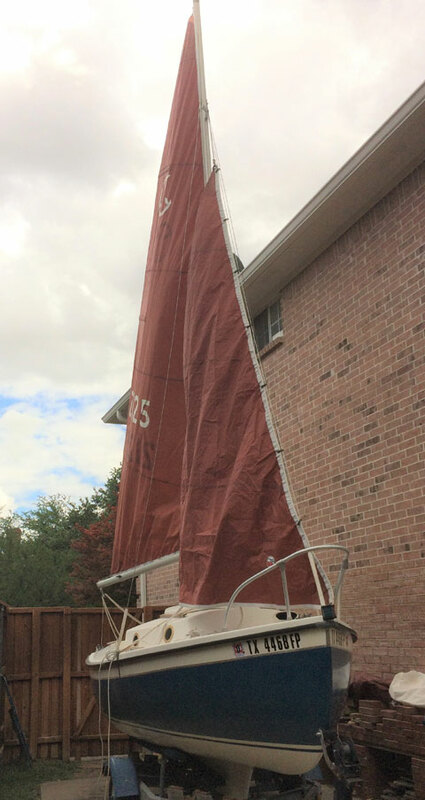 3 original sails crisp in very good condition - main, jib, and 130 genoa. 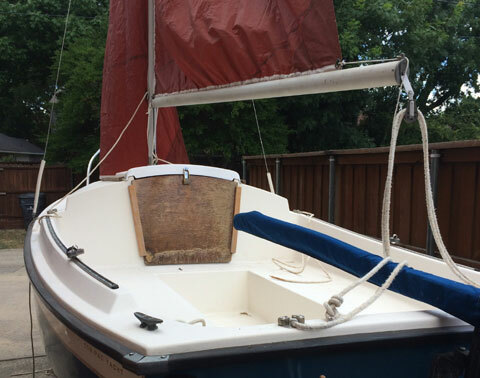 450 pounds ballast in shoal keel for great stability in this pocket cruiser. Replaced tiller with a new Com-Pac solid ash tiller. Also replaced slides for hatch and dropboard with new Com-Pac parts. 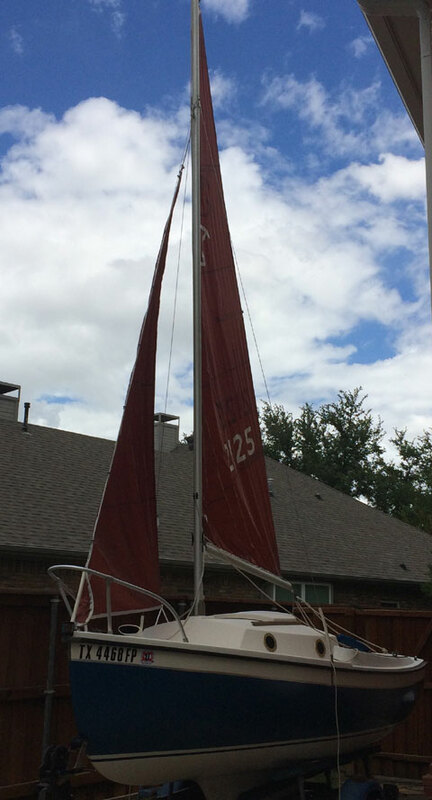 Halyards, rigging, deck hardware, tiller in very good condition. All lines are led to cockpit for easy single-handed sailing. Wooden dropboard (hatch to cuddy) is functional but needs refinishing. 1984 Evinrude 4 HP Yachtwin in good working order with external tank. Tilting trailer in good condition replaced lights and wiring, and tires. Has Buddy Bearings. Trailer lights need some work. TX title is current. Has cradle for storing mast and boom. 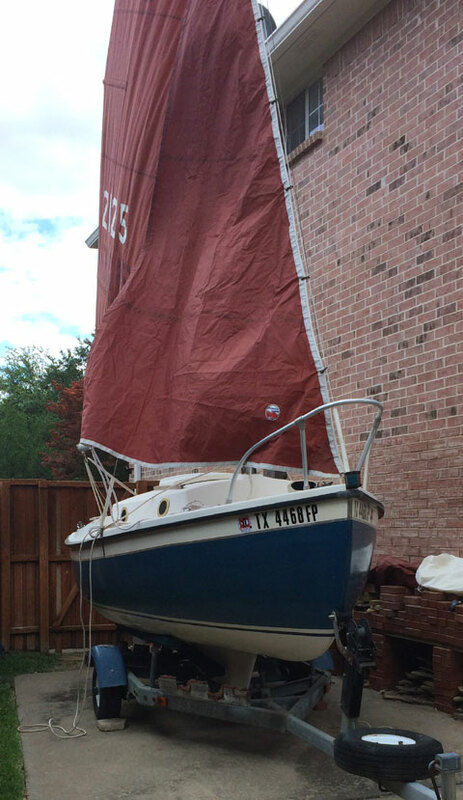 Needs a battery to power circuit switch panel for bow, stern, and interior lights - I day sailed only. Also includes: boat cover; trailer lock; life jackets; dock line and fender. The Com-Pac 16 is an ideal trailerable pocket cruiser. A rugged, stable, and seaworthy boat yet small enough to fit in a garage and light enough to be towed by a small car. The solid fiberglass hull is in great condition and was constructed for strength and durability by Hutchins in Clearwater, FL. Selling as I no longer sail.